This Enderes, 4-Piece Pry Bar Set includes four pry bars, each designed with an angled blade for extra leverage. The pry bars each have a Super-Grip square plastic handle design for comfort and precision, reducing hand fatigue and slippage, even when your hands are greasy. And their blades are hardened and tempered steel, for maximum durability. 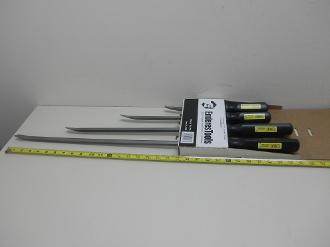 Set Contents: one each, 12", 17", 25”, and 31” Bent Tip Pry Bars.